This letter is being sent to attendees today - hope to see you here soon. Well, it is nice and cooled off in L.A. – a nice 90 degrees or so. 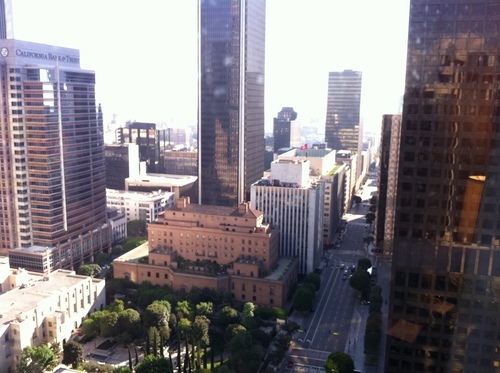 I stopped in my room at The Westin Bonaventure Hotel – and let me tell you the hotel is amazing! They updated the rooms and the look of the hotel, it is a great atmosphere. It is located right near L.A. Live, which has exploded with more and more restaurants than ever and special events tents are already set up in the area for L.A. Live’s Weekend Activities! I am currently at the Los Angeles Convention Center - where the team is busy setting up for this year’s event! The dealership is also delivering the Mustang Convertible that one lucky attendee will win on Wednesday! I hear it is a beauty! When you arrive at registration, you will receive a giveaway card that you need to get stamped at the specific exhibitors booths in order to be entered to win the Mustang Convertible – talk about a great souvenir! When you get here, remember that ITEXPO is being held in South Hall K – Registration is located in the South Hall Lobby, Exhibits are located in South Hall K. See below for activities happening at ITEXPO next week. I am excited to see you tomorrow night at Avaya’s Kick-Off event at the Westin Bonaventure, then on Monday at the Los Angeles Convention Center for the official start of ITEXPO. Please don't hesitate to call Frank Coppola at 203-852-6800 x131 if you have questions about the event or would like to register over the phone. I look forward to seeing you when you get here! Have safe travels! See below for a complete, updated schedule or visit the ITEXPO site. 4:45 pm . GRAND PRIZE Mustang Convertible Giveaway - Must be present to win! Visit www.itexpo.com for complete descriptions.